The 61st Annual Grammy Awards took place at Staples Center in Los Angeles last night, February 10. Among the guitar-based artists who took home statues were Greta Van Fleet, High on Fire, St. Vincent and, posthumously, Chris Cornell. 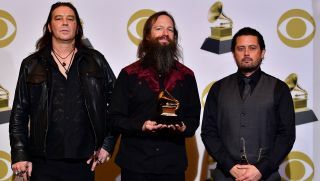 High on Fire’s “Electric Messiah” won the Best Metal Performance Grammy, coming out tops in a category that also featured Deafheaven, Trivium, Underoath and Between the Buried and Me. In the Best Rock Performance category, Chris Cornell won for his song “When Bad Does Good.” Other nominees included The Fever 333, Arctic Monkeys, Greta Van Fleet and Halestorm. Finally, the Best Rock Song Grammy went to St. Vincent, for “Masseduction,” who was nominated alongside Ghost, Twenty One Pilots, Bring Me the Horizon, and, once again, Greta Van Fleet, in the category. For more information and a full list of winners, head over to Grammy.com.